In the 1973 science-fiction classic Westworld, the robots that staff the film’s fictitious holiday resort are indistinguishable from their human guests, except for one small clue: the engineers, we are told, haven’t perfected the hands yet. The capabilities of real-world robots fall a long way short of those of Westworld’s murderous hosts, but on this small point, reality and fiction are in agreement: hands, and the manipulation of objects, are particularly challenging aspects of robotics. says Ken Goldberg, an engineer at the University of California, Berkeley. In the past 50 years, robots have become very good at working in tightly controlled conditions, such as on car-assembly lines. says Juxi Leitner, a robotics researcher at the Australian Centre for Robotic Vision (ACRV), based at the Queensland University of Technology in Brisbane. But the world is not a predictable assembly line. Although humans might find interacting with the countless objects and environments found beyond the factory gates a trivial task, it is tremendously difficult for robots. 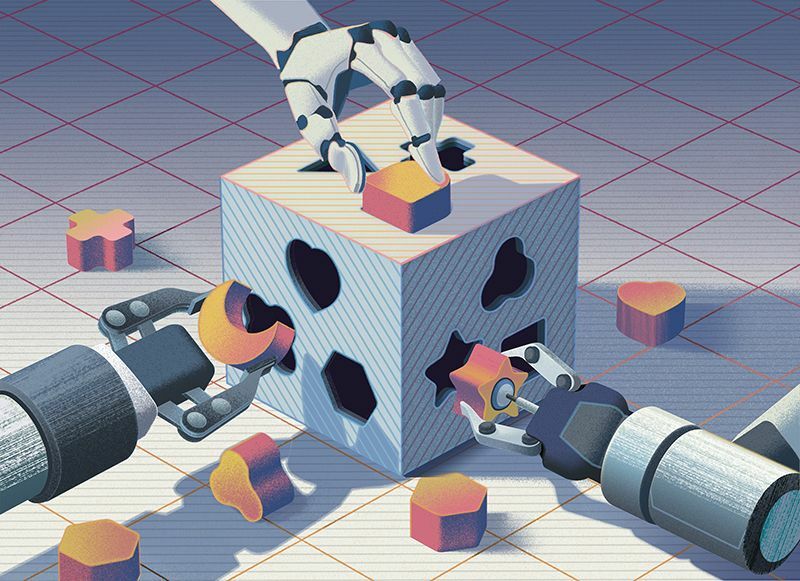 These unstructured environments represent the next frontier for researchers across the field of robotics, but such environments are particularly problematic for robots that grip. Any robot hoping to interact physically with the outside world faces an inherent uncertainty in how objects will react to touch. Some researchers are using machine learning to empower robots to independently identify and work out how to grab objects. Others are improving the hardware, with grippers ranging from pincer-like appendages to human-like hands. And roboticists are also gearing up to tackle the challenge of manipulating objects gripped in the hand. Advances in robots’ ability to handle objects could have enormous societal impact. Commercial entities, particularly those involved in the movement of varied goods, are following developments closely. The heightened industry interest is exemplified by an annual competition organized by e-commerce giant Amazon for the past three years. The Amazon Robotics Challenge asks teams of researchers to design and build a robot that can sort the items for a customer’s order from containers and place them together in boxes. The items are varied, ranging from bottles and bowls to soft toys and sponges, and are initially jumbled together, which makes it a difficult task in terms of both object identification and mechanical grasping. In July 2017, Leitner’s ACRV team claimed victory with a robot called Cartman, which resembles a fairground ‘claw’ game. An aluminium frame supports the claw assembly.The robot has two tools for picking up objects, known as end effectors: a gripper with two parallel plates, and a suction cup backed by a vacuum pump. For each object the robot encounters, the researchers specify which effector it should try first. If that doesn’t work, the robot switches tools. First, however, the robot must find the item it’s looking for. The team tackled this challenge by using machine learning. The main input for the robot is an RGB-D camera, a technology that is popular among roboticists and that can assess both colour and depth. The camera looks down from the effector into the boxes below. From this vantage point, Leitner explains, Cartman labels each pixel according to the object it belongs to a form of deep learning known as semantic segmentation. Once a cluster of pixels representing the desired object is found, the camera’s depth-sensing capability helps the robot to work out how to grab the item. Rapid advances in machine learning underpin a lot of recent progress in grasping. says Pieter Abbeel, a deep-learning specialist at the University of California, Berkeley. These developments have, he says, opened up “whole new avenues of robotics applications”. Abbeel is co-founder and chief scientist of covariant.ai, a start-up in Emeryville, California, that uses deep learning to train robots. Rather than program a robot to perform a specific action, humans provide demonstrations that the robot can then adapt to deal with variations of the same problem. The human trainer views the camera feed of the robot arm through a headset, and uses motion controls to guide the robot arm to pick up objects. The process feeds a neural network with data on the approach taken. Goldberg uses machine learning to teach robots to grasp, too. But rather than gather data from real-world attempts, his Dex-Net software is trained virtually. “We can simulate millions of grasps very quickly,” he says. The software lets an industrial robot pick objects from a pile with a success rate of more than 90%, even if it hasn’t seen those objects before. It can also decide for itself whether to use a parallel-jaw gripper or suction tool for a particular object. Dex-Net’s fourth incarnation will be presented in 2018. 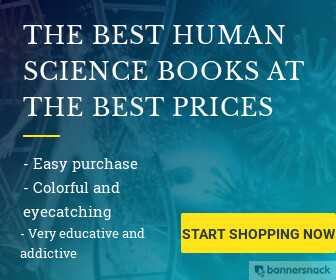 According to a metric being developed by Goldberg and roboticists around the world to aid reproducibility, known as mean picks per hour, the Dex-Net system is now among the fastest pickers around. 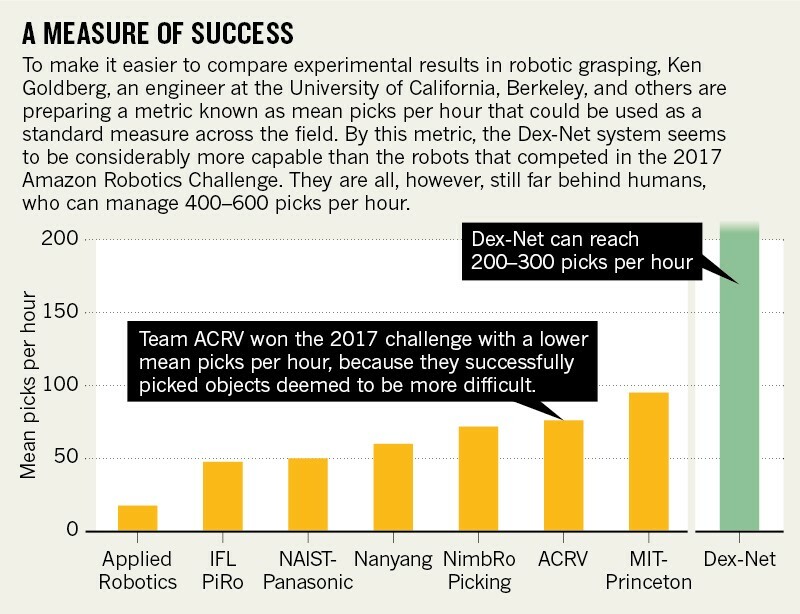 It can achieve over 200 picks an hour — still behind human capacity, estimated at 400–600 picks an hour, but far ahead of the numbers achieved by the teams at the most recent Amazon Robotics Challenge (see ‘A measure of success’). The combination of a parallel-jaw gripper and suction employed by both Goldberg and Leitner is a popular choice: most teams at the 2017 Amazon Robotics Challenge took this hybrid approach. But how these tools grasp objects planning contact points before moving into position as precisely as possible is very different to how we humans use our hands. says Oliver Brock, a roboticist at the Technical University of Berlin. We do not think about where we need to place our fingers. The softness of human hands allows for something called compliant contact the fingers mould against the surface of the object. Many are seeking to exploit the benefits of compliance in grasping by building softness into robot grippers. Brock’s lab has developed the RBO Hand 2, a human-like hand with five silicone fingers. The fingers are controlled by the movement of pressurized air, which allows them to curl and straighten as required. Although the human-like arrangement of the fingers might not be suited to every task, it is ideal for interacting with the world we inhabit. The benefits of softness are already drawing commercial interest. Soft Robotics, in Cambridge, Massachusetts, produces air-actuated grippers that have a more claw-like design than Brock’s research model. OThe robots are already being trialled in a factory setting, handling delicate produce without damaging it. Another start-up, Righthand Robotics in Somerville, Massachusetts, is adding softness to the claw and suction set-up so popular with roboticists. Its claws have three flexible fingers, arranged around a central suction cup that can be extended to draw in objects. The design takes inspiration from birds of prey, says the company’s co-founder Lael Odhner. In these birds, most of the forearm musculature is attached to a single group of tendons that reaches to the tip of the claw, he says. Similarly, all the power of the motors in Odhner’s robotic claws is put into a single closing motion. This simple action improves reliability a crucial consideration for grippers intended for commercial use at the expense of the ability to perform delicate motions. The extendable suction cup makes up for this shortfall. Softness is still relatively new to robotics. A common criticism is that it’s hard for a soft robotic hand to perform a useful action with a grasped object. “You grab it very well,” explains Rus, but “you don’t know exactly the orientation of the object inside the hand”. This makes it tricky to manipulate the object. Goldberg echoes this: “If you just have a soft, enveloping type of hand, then you’ve really reduced your visibility of that object,” he says. The way people solve this is simple: we touch. But few robots have been granted this capability. “People agree that it is important,” says Brock it’s just very difficult to do. He is pursuing two approaches to giving his soft robot hands a sense of touch. The more-mature method involves embedding tubes of liquid metal in a silicone sheet wrapped around the finger. His team can then monitor applied forces using the electrical resistance along the tubes. “It’s measuring strain all over the finger and inferring from that, through machine learning, what actually happens to the finger.” The team is currently assessing how many of these strain sensors are required on each finger to measure various forces. Brock’s other approach to incorporating touch centres on acoustics. In a proof-of-concept test, a microphone was placed inside the air chamber of a soft finger. The sound that was recorded enabled researchers to identify which part of the finger was touching something, the force of the touch and the material of the object. The ability to tuck the microphone deep inside the finger and therefore avoid reducing compliance sidesteps a key issue with sensorizing soft fingers. Brock says that the details of this work will be published soon, and that he plans to work with acoustics specialists to improve his design. Many roboticists think that there is unlikely to be a universal solution to grasping. Even if robots could achieve human levels of dexterity, Rus points out, “there are lots of things that we cannot pick up with a human hand.” But as robots become increasingly adept at handling variability, more tasks currently performed by humans will become automatable. Whatever the outcome, a lot of development needs to be done before any robot revolution can take place. Leitner’s team might have won Amazon’s challenge last year, but its robotic arm fell to bits on the first day of competition, and most teams experienced technical issues of some kind or another.